At the time my mom was devastated. To top it off they had been living in a small town so everyone knew. While I felt sorry for my mom, alone in her house, I was oddly relieved. My brother was living on the coast and I was married and living in Calgary when the news broke..I was really happy for my dad. The way he went about leaving my mom was not ideal, however; I was glad he had broken free and was charting his own path to happiness. My parents had not been happy as long as I could remember. Even when I was in grade eight helping my dad chop wood, I remember telling him to get a divorce. No, they wanted to stay together for the sake of my brother and I. Please!! Needless, to say I could not wait to leave home once I graduated. Our home had been a toxic soup of blame, resentment and false smiles when friends or relatives showed up. My mom eventually moved to the coast and for years after, visiting her during the holidays was especially difficult as she continually held on to the bitterness of my dad leaving her. I was growing spiritually and as much as I deeply loved my mom, I could no longer tolerate her harsh words and negative attitude towards my dad. I shared with her that if she wanted to see me, she would need to find a way to learn how to forgive and let go of the past. Within the next year and through a turn of divinely timed events my mom woke up and recognized how her negative thoughts about life were creating a world of dis-ease and loneliness. She was finally ready to let go of the pain of yesterday and since I was now a Relationship Coach, she asked if I could help her cross the bridge and create a new family connection. I was so proud of her and asked her if she wanted to move to Calgary and live with me since my brother was now living here as well. Six months later, my mom moved in with me. With a willingness and learning attitude she took my coaching program. It was not easy to shift the mind of a woman who was sixty four years young but she did it!! As she forgive herself for all the pain she had caused, she was able to forgive my dad and my now step mom. She began to see the divine gift in everything and through forgiveness her heart opened. And a new man stepped into her life. A man who became my step dad. Forgiveness and choosing to let go of the past brought a new way of being into my mom’s life. So much so, that when I had a house party I invited both sets of parents to meet for the first time since my dad had left. Both asked their Higher Self to be present and sure enough the introduction of the four led to the most incredible reunion of laughter, connection, and shared memories. A new bond of friendship was born. Every year after, until my step father passed away, we all spent every holiday together. Love made a dream come true. I organized a trip to New York for both sets of parents and my brother and I. That trip was a highlight of my life as I sat and witnessed my mom and step mom giggling like little girls as they shopped in Macy’s. It was all because many years ago, my mom said yes to forgiveness, let go of the past and divinely stepped into life. Are you saying YES to your life? Are you bored with the status quo or are you taking steps to fulfill your dreams? There is, where you are right now, which is your current reality, then there is that place in your mind, that never ending dream or vision of where you want to be, your preferred reality. If your current reality is one that is familiar you may feel a sense of boredom, restlessness or experiencing stagnation in your relationships, your business and/or your life. Familiarity is great as it creates a sense of comfort and security however; our spirit always seeks newness. And of course, newness always brings us into the unknown. Stepping into the unknown can amplify the fear and uncertainty in our minds. I have lived most of my life in the unknown, not knowing where the money would come to pay the rent, not knowing if my business would attract paying clients, not knowing where I was going to live, and on and on. Then I began to realize that my Higher Self was guiding me on the most incredible journey, the journey beyond the familiar, the journey of manifesting my dreams. To live my dream I needed to be a completely different person than I was and this meant complete upheaval of all that was known. I believe that everything in our lives that is not built on a solid foundation of truth must collapse. We are in the midst of a planetary awakening and we are shifting from a fear-based world of greed, competition and lack to a love-based world filled with generosity, respect and abundance for all. No matter who you are, no matter what you have done or not done, YOU can live in the freedom frequency of life. Now is the time to leave your fear and judgments behind and replace them with curiosity. I ask you, “Are you ready to know more, to experience more, to feel more than you ever have? Are you ready to experience your connection with the Divine rather than just reading about it? Are you ready to claim your power? Are you ready to live life fully and love deeply?” If you answered yes to any of the above questions, then congratulations,you are ready to dive deep in to the most fascinating journey. You are now an explorer on an amazing adventure~ A journey beyond the familiar. Fear or Love? The Choice is Yours. We All want Love. To feel love. To be loved. So why are we so afraid of love? Why are we so afraid of each other when love has the power to set us free from negativity and limiting beliefs. Love has the power to remove self doubt and fill us with knowingness. Loving our moments frees us from from the ties that hold us back. In the realm of love we have the freedom to express and be who we want to be. Yet, we are afraid of this powerful force that moves through us. To answer these questions there is one thing we must remember. We live in a world made of energy and thought vibrations which express themselves in our physical world. It is important to understand that the duality of life is expressed in either dark (fear) or light (love) vibrations. We either vibrate in fear based vibrations such as ~ stress, anger, manipulation, greed, sadness, scarcity, depression, loneliness, addiction, depression, jealousy, illness etc. Or we vibrate in love based vibrations such as ~ freedom, peace, joy, compassion, bliss, truth, oneness, health, abundance and the list goes on. So the question remains ……. 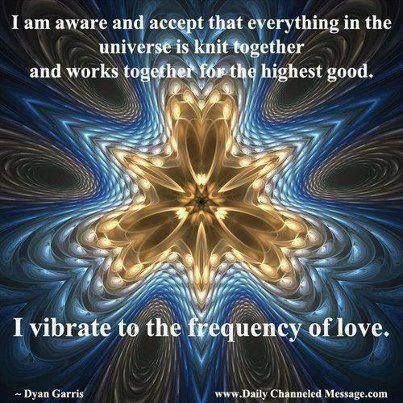 WHERE DO YOU VIBRATE IN LIFE ~ Fear or Love? The answer is clear when you get real with how you feel about your life as it is right now. Are you discouraged, frustrated or stressed? If so I invite you to feel into your body, into the energy that moves through you and witness the sensations, the tenseness, tightness, resistance. Breathe deeply into your belly. This is fear and it is ok to be here. You just don’t want to stay here. Or maybe you’re at the other end of the spectrum and have tuned into the vibration of love. Are you feeling the energy of appreciation and gratitude for where you are? Do you see that each situation or challenge offers you the opportunity to be a better human being? I invite you to share with me what love means to you and where you’re vibrating in your life ~ fear or love? And remember, there is no right or wrong answer. It is a good place to start.